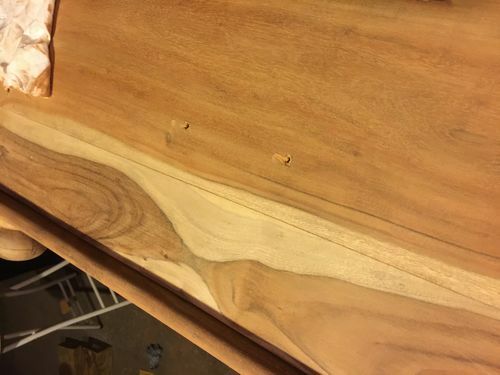 Trying to refinish a cabinet that I think it is Eastern Red Cedar. Very old cabinet from Germany, made over 50 years ago. It looked gray without any beauty or grain. Very heavy compared to any other wood I have worked on. 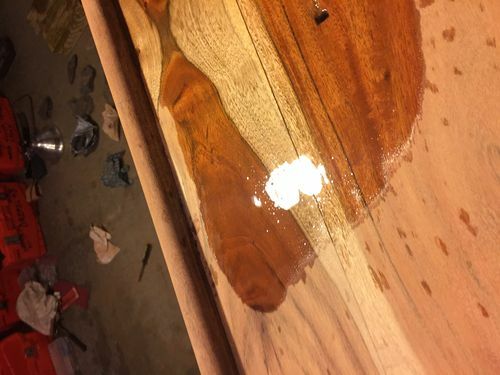 Reddish and White when I apply Lacquer thinner to wipe off the wood. I did some reading about Eastern Red Cedar and someone mentioned that this wood, eastern cedar has oils and must apply seal coat of shellac, otherwise the varnish will not dry. It is very hard, feels like a rock . Had a gray look before I sanded it. As soon as I wet it a bit with solvent lacquer it shoes beautiful color, reddish and white. I will try to smell it as soon as I get home from work. I used lots of lacquer thinner and acetone to wipe old grime, waxes, and oils that were used. That doesnt sound like cedar, cedar is soft , usually some what knotty .. Need a picture. If it is actually from Germany I doubt that it is Eastern Red Cedar. Eastern red cedar is just a little bit softer than Cherry. Cedar 900 Janka, Cherry 950 Janka. Eastern Red Cedar is a juniper it doesn’t have much or any oil some of the knots may bleed. You might want to seal them with shellac but if it is actually 50 years old any sap will have dried up long ago. As Charles says pictures would really help. If you sand down to new wood the cedar small will fill your shop. You’ll smell it as soon as you walk into the shop. You haven’t mentioned any smell and you would notice that immediately.Hence the name aromatic red cedar. As a classical guitar player I know that whenever I see a new guitar, I try to smell it inside because of the beautiful cedar scent. But this doesn’t have that obvious scent of cedat. And it is impossible to put a nail in it; must dril first. Need a picture. If it is actually from Germany I doubt that it is Eastern Red Cedar. Eastern red cedar is just a little bit softer than Cherry. Cedar 900 Janka, Cherry 950 Janka. Eastern Red Cedar is a juniper it doesn t have much or any oil some of the knots may bleed. You might want to seal them with shellac but if it is actually 50 years old any sap will have dried up long ago. As Charles says pictures would really help. Now that I think of how much sanding I did yesterday, I didn’t notice any scent of cedar as I do when I see a new guitar made with cedar; you feel it right away. I would like to go with the Waterlox varnish. Would you recommend a seal coat of Shellac or not needed anymore ? Eastern Red Cedar is as common as weeds around here. I have cut down several in my yard and I wish the rest of them were gone. It is a little bit oily but I never heard of anybody having to seal with shellac prior to varnishing if it has been dried well. It is a popular wood for building bird houses because it is rot resistant. I just ground up a stump in my yard that had been there since I cut the tree down 30 years ago. The only use I have for it is to CNC carve outdoor signs for campers and rustic cabins. I have not found it to be very heavy or very dense. Are you sure we are talking about the same species? I don’t know the woods well. I am just learning it each day after work. My wife calls it my “Mid-life crisis” but I think it is the nicest hobby weather married or not married. I am amazed how much there is to know to make wonderful finishes. Even my kids find reasons to hang around me more. Definitely not cedar can’t help beyond that. Definitely not cedar can t help beyond that. Actually now that I think of it, I don’t smell cedar after so much sanding.